Most large companies worldwide today have some kind of shared services concept in place. Over half of the medium and large companies are currently engaged in some kind of shared service project activity. The investment in shared services is always calculated in millions. In other words, the costs of getting it right (or getting it wrong) can be huge. 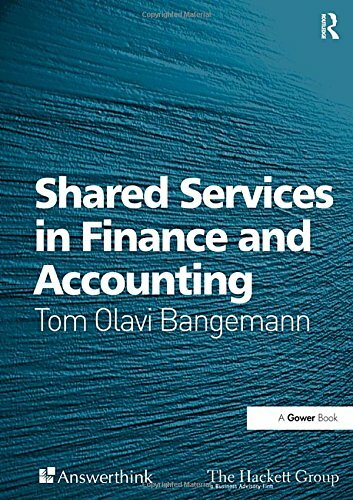 Tom Bangemann's book is a concise blueprint for identifying, assessing, designing, implementing and improving the process for shared services in the finance and accounting function. The author focuses on critical success factors, the people issues involved, and learning from other people's big mistakes. The book includes a variety of real life examples and real benchmarking data, performance metrics and best practices. The section on implementation is based on a proven five-phase methodology and explains the steps and activities involved as well as showing examples of the deliverables and the results you can expect. Any CEO, MD, CFO, Finance Director and senior finance people will find this book a 'must-have' guide to the process before they start and an excellent benchmark against which to measure the performance of any existing shared service operation. Tom Olavi Bangemann is Vice President, Business Transformation at The Hackett Group, the world's leading best practice and benchmarking company. Tom has over 10 years' experience in accounting and consulting and has helped clients on over 25 shared service projects in the past 7 years, which included: all phases of the shared services lifecycle; a range of different industries, countries and company sizes; the internal shared services choice, as well as outsourcing to a BPO. Tom has been publishing articles on shared service topics for the past 5 years and appears regularly as an acknowledged expert in speaking and chairman roles on approximately 5-8 shared service-related conferences each year. Privately, Tom is married to Kristina Marie and they have a son called Ben.